My Julep Maven (September 2014) Customized Boho Glam Box Unboxing, Swatch and Review! Remember how I said I wasn't getting anything from the September collection? Yeah, well I lied. :) Unfortunately with the 31 Day Challenge going on I didn't have any time to actually go through and swatch this box, so that's why it's been so horribly delayed. But we're here now, so let's get right into it! 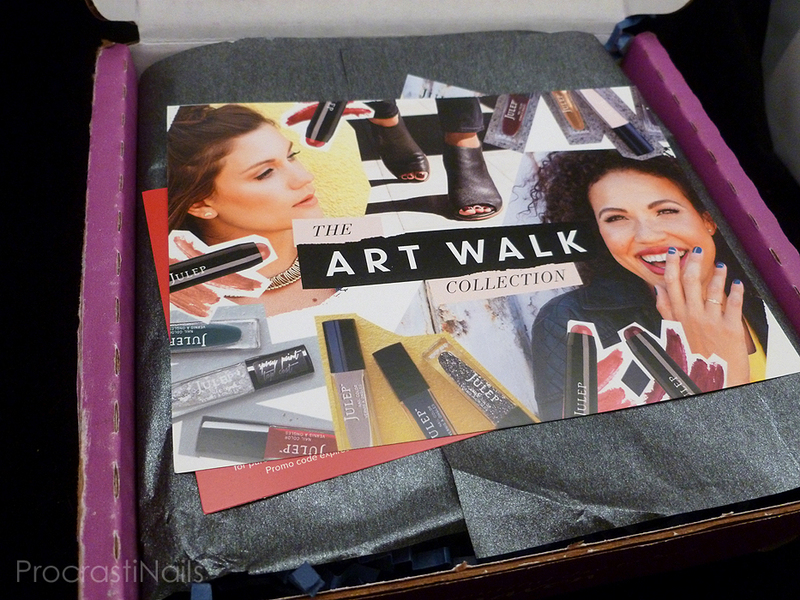 This month Julep brought us The Art Walk Collection! What does 'Art Walk' mean? How do these colours align with it? I have no idea! But they were all pretty, muted shades with some fun finishes scattered throughout. Indeed it does! I think that's a lot of times what holds me back from trying new looks or techniques, the fear of not doing well or ruining something. It's definitely what stops me from trying new nail shapes! JULEPPERK for 30% off your next Julep order, two uses per customer, valid until Sept 30/14. I guess the fact we got a cool bonus gift last month gave them an excuse not to send me anything this month? Hm. From what I heard it was once again hard candy so I'm thinking maybe they just don't send candy to Canada anymore. Oh well, no loss there! The beauty items were Plush Pout Lip Crayons which looked fun but since I don't wear lip products seemed like a waste for me. :/ I know people were excited for them and I think they sold out after the box came out, so if you want to see swatches take a look elsewhere online! I picked up three polishes this month: two satin finishes (because I can't keep myself away from them) named Mary Lee (red) and Quinn (blurple), and one grey crème finish named Erin. You can check out all the colours in this collection in my preview post. This one fought me tooth-and-nail when it came to capturing the colour properly, and in reality I'd say it's a bit more yellow-leaning. It makes me think of elephants! :) Erin is a lovely soft grey that went on perfectly and pictured here is two coats with no top coat. No difficulties or unexpected issues, just a great standard Julep crème. Mary Lee seems to have been the popular shade this month. I don't have anything like it! It's a deep wine burgundy that makes me think of leather. I found it a bit more glossy than I was expecting from a satin, and in the right light it actually looks more like a crème (albeit a dull crème). Application was great and what you see is two coats, and the only issue I had was that this polish had a slightly stronger chemical scent than I was expecting (or am used to from Julep). 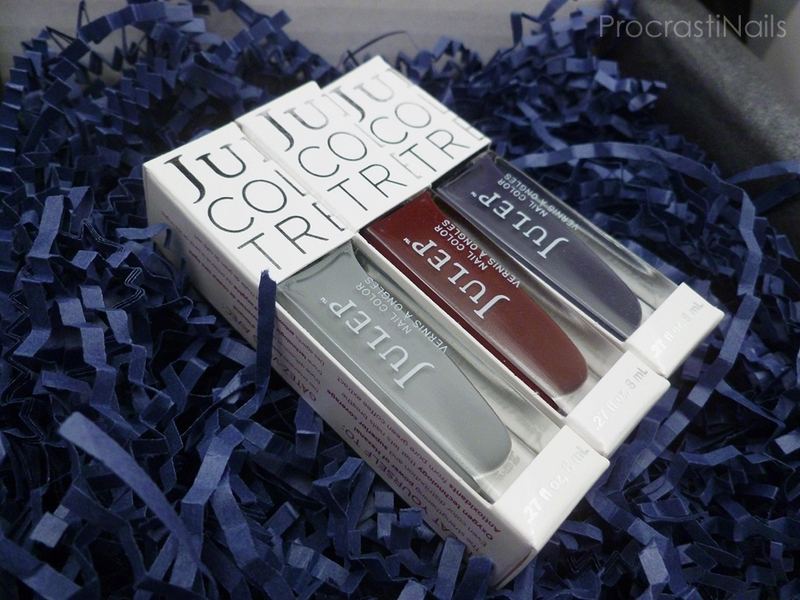 The first time I opened my box I thought Julep had sent the wrong polish because I distinctly remembered in my mind that I had ordered a purple and they sent me a blue. But no, Quinn is just a LOT more blue-leaning in the blurple family than Julep's official pictures and swatches had made it look. 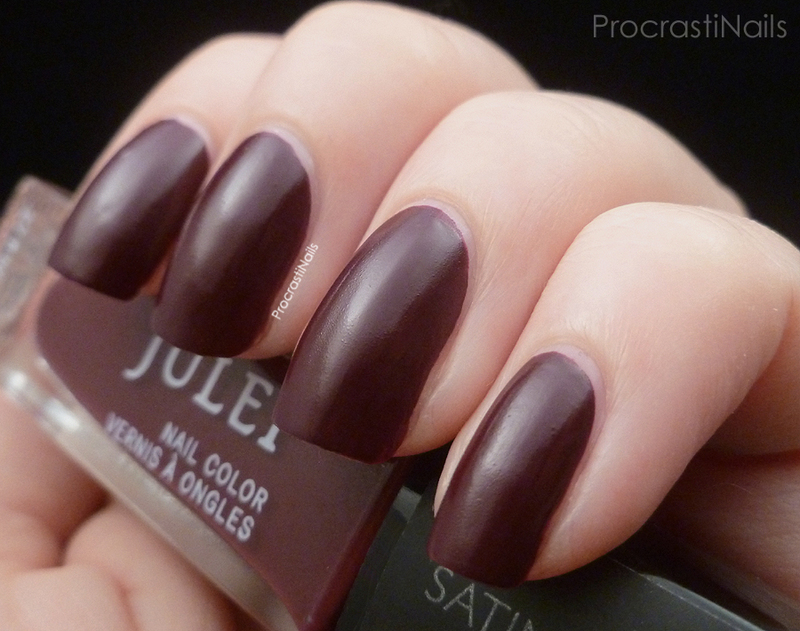 If you look at the bottle in my preview post you'll see it looks like an entirely different shade. Quinn applied fairly well, though the first coat of this one is very sheer. I used two coats without top coat for these pictures (though I would recommend using three to be safe) and like Mary Lee this one had a stronger chemical scent. It also took a longer time than expected to dry to a satin finish. One thing that was different this month was that Julep changed the formula in their polishes again, this time to include their Oxygen Technology (like the newer base and top coats). I'm guessing this is the reason the two satin finishes had a bit more scent then I'm used to from Julep polishes - still perfecting the formula. Let me know what you think about the colours from this month (well, last month technically)! Thanks for visiting! Nice colors for the month. There great for fall too. Perfect fall colours! Love the semi matte finish!